Striking a balance between sensitivity and false rejects is a necessary tradeoff when metal detectors are deployed in a food or beverage plant. The good news is that today's metal detectors are vastly superior to those of even a decade ago, allowing manufacturers to increase sensitivity without experiencing unacceptably high reject rates. The better news is that some new detectors can accommodate a wider range of products, thanks to enhancements in multi-frequency technology. An example is the THS/MS 21 series from the Italian firm CEIA (pronounced CHAY-ya). Introduced commercially in 2009, the units are able to differentiate between metal contaminants and so-called product effect conditions, when high moisture or salt content can alter the electromagnetic field and cause the machine to reject good product. The CEIA detectors use multiple frequencies simultaneously and continuously, while other multi-frequency detectors use one frequency at a time. As a result, metal detection sensitivity is maintained, even when product effect false rejects are an issue with a given product. Both magnetic and non-magnetic metals are detected, and an electronic record is generated for each reject. Construction is 316 stainless, and the units carry an IP65 rating. "Temperature change is the biggest problem customers have, particularly on a frozen-food line," says Todd Grube, inspection product manager for Heat and Control Inc., the Hayward, Calif., equipment supplier that began distributing the CEIA THS 21 in North America three years ago. By polling the detector, a manufacturer could use the electromagnetic signals to identify a drift in product temperature and address thawing before it becomes a quality issue. "It's not science fiction," says Grube, "it's a realistic idea." A dual frequency range is coupled with vibration immunity in the Xtreme metal detector, a new offering from Eriez, an Erie, Pa., supplier. Multiple frequencies not only allow food manufacturers to screen multiple products on the same line, they give users latitude when dialing in the product, making it less critical to use a precise frequency, according to John Klinge, product manager-metal detectors. Two years of R&D work preceded the launch of the new series, and the improvements go beyond frequency settings, he adds. Electronic noise in a plant contributes to the false-reject problem, and the new machines do a much better job of filtering out that noise. Simplified operation was also emphasized in the development process. "We want to take a lot of the guesswork out for the operator," Klinge says. Adds Josh Layhue, R&D project manager: "You can have a great machine, but if the majority of the users don't know how to set it up and run it, all that technology is lost." An icon-heavy, 7-in. color touchscreen provides an intuitive interface for operators. "We're half a step away from making that happen on a smart phone," says Layhue. Bunting Magnetics Co. introduced a dual-frequency machine a decade ago to appeal to copackers and other food manufacturers that want to inspect multiple products with a single detector. Last year the Newton, Kan., firm upgraded the electronic components for better signal amplification. Bunting dubbed the improved detection capability "multimode." "The user interface has changed dramatically," according to Rod Hendrick, Bunting's product manager-metal detection. A color screen, drop-down menus and other refinements reflect an effort "to automate a lot of the routines of operation." Calibration checks are an example: Instead of passing a deliberately contaminated test package through the machine, "we added an induction coil in the head, and the detector pings itself periodically," Hendrick says. Multi-frequency and multi-spectrum features are well and good, suggests Bob Ries, lead product manager for metal detectors at Thermo Fisher Scientific Inc. in Minneapolis, but there are other ways to skin the sensitivity/false reject cat. Among them is the configuration of the coils that transmit and receive a magnetic signal. His firm incorporates multiple coils in its design. "Multiple frequencies have been around for years," he sniffs. "It's been more of a marketing message than a benefit to the manufacturer." Coil design and how effectively the machine is able to digitize the analogue signal to filter out background noise have just as much of an impact on the sensitivity/false reject balancing act, Ries asserts. There's no argument, however, when it comes to simplifying set-up and operation. "It's harder technology to wrap your head around than X-ray," he says, and many plants rely on a single person to modify the operating parameters when necessary. If that individual leaves, a skills-void opens. Consequently, service calls are increasing. On the other hand, the proliferation of touchscreen controls that emulate a smart phone's operating system is helping to raise operators' comfort level. Color monitors with touchscreens are making metal detectors like Mettler-Toledo's Signature unit more user friendly. Engineers at Mettler-Toledo Safeline were cognizant of the ease-of-use need while executing a recent upgrade. A full-color touchscreen with membrane key panel is standard in the firm's new Signature metal detector. "Automatic set-up on the fly" is not, however, according to Geri Foley, metal detector sales manager at the Tampa, Fla., firm: For that and Optimized Set-up, end-users will have to upgrade to the Pro Select series. Pro Select allows users to dial in a frequency in the 200-850 kilohertz range to fit the product. A slight tweak can have a big impact, Foley says, particularly with highly conductive products like ice cream. 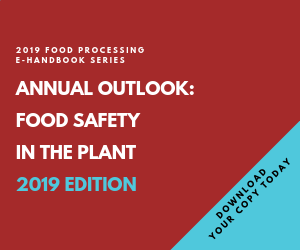 User access codes help create an electronic record of who accessed the equipment and what changes were made, making the machines compliant with 21 CFR 11, if and when FDA begins applying the regulation to food as well as pharmaceutical manufacturers. Data export and performance monitoring is available through ProdX software, a management package that will be Ethernet I/P compatible by year end, she adds. Condition monitoring capabilities are built into higher-end units. If inspection performance begins to drift, the system will generate an alert for recommended maintenance procedures. "In a heavy-duty washdown environment, this provides an early warning before the machine goes down," says Foley. High-pressure spray has permanently sidelined many metal detectors, which is why Eriez upgraded protective covers for machine electronics to IP 69K, the European standard that exceeds NEMA 4X, according to Klinge. Thermal shock caused by hot water sprayed on a cold metal detector is a common problem in meat, poultry and seafood plants. Thermo Fisher Scientific believes it has developed a machine that can withstand the shock, and it's backing it up with a three-year warranty on its Apex-HD metal detector. Ries maintains Thermo Fisher has gone even further with Apex HD, a machine that not only resists moisture like a duck but also can withstand thermal shock in a refrigerated environment. After cycling the unit through a car wash 10,000 times, managers were sufficiently confident to offer a three-year warranty at no additional cost. "Poultry plants usually face huge (machine) repair bills after 1-3 years of use," he says. Five poultry processors are the first food companies to install the new heavy-duty units. Many factors can disrupt a machine's detection ability: thermal shock, stainless steel and other nonmagnetic metals, ground loops from adjacent conveyors (Mettler-Toledo and Eriez are among the suppliers who offer turnkey solutions, including an "almost tool-less" hygienic conveyor from Eriez, according to Klinge). Without question, advances in sensitivity over the past 60 years are impressive, and they continue to be made. Aperture height and metal type have a bearing on sensitivity, but even at a height of 12 in., particle detection below 2mm can be delivered with today's machines, says Ries, about half the standard of a decade ago. X-ray machines are gradually replacing metal detectors at the end of the line, but food processors are fitting metal detectors into upstream processes to intercept contaminants earlier. As performance improves and false rejects decline, these machines are securing their relevance for years to come. Company ensures metal-free spices with Eriez Xtreme Metal Detector.